The Festival is proud of its 42 year heritage as an iconic arts and cultural event that celebrates summer in Sydney. Our program presents high calibre local and international acts that entertain, enliven, educate and enthrall our audiences. 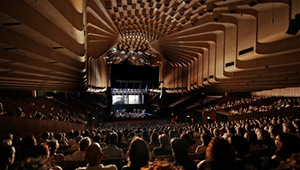 Sydney Festival collaborates with a variety of organisations to create bespoke partnerships that support a diverse range of business objectives. For further information please refer to the 2017 Sydney Festival Annual Review here. We are keenly aware that our partners deserve evidence that their investment in Sydney Festival is successful and that KPI’s are being achieved. To assist the Festival in providing our partners with comprehensive evaluation of their sponsorship, a proportion of questions asked in our research are focused on the effectiveness of partner’s activities and sponsor recall. Partnership opportunities for the 2018 Sydney Festival are available until the end of December 2017 and planning is already under way for 2019. Please contact Brooke Ravens (Senior Sponsorship Manager) on brooke.ravens@sydneyfestival.org.au or (02) 8248 6565.